Sunflower Stamper: Why I'm NOT stamping!!! Once again, Blogger is acting up! I hope this isn't becoming a common theme. I started this post last night, but couldn't upload the pics! Our new vehicle has arrived!! It arrived Wednesday, but we picked it up early Friday morning!! I keep calling it the car, but it really isn't. It's not a truck, not even technically an SUV. Crossover is the official term. Car works much easier though in everyday conversation!! 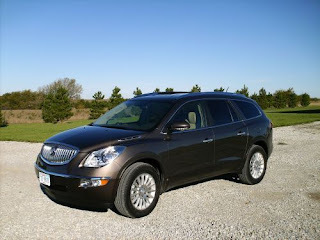 Here is our Buick Enclave! The color is "Cocoa Metallic". It will always be dusty because of our road, but that would happen with any color vehicle! We liked this-it's unique. I have yet to even see another of these one the road, much less one the same color! It is "All Wheel Drive" and will seat 8. So far, we are loving it!!! It's very nice to have "our" vehicles back! I've been driving hubby's truck while waiting on this one. We had a van that we were trading in, so we wanted to put the miles on it and save some on his truck. He drives 30 miles into Lincoln everyday, so they add up fast! I do enough out here just running between home and town and around, but thankfully not 60+ a day!!! So, no stamping on Saturday! Between commitments, I spent time tinkering with it-learning what all the buttons and such do! And no stamping yet today either. Our "farmers" made it here today and have started getting our beans out. YEAHHHHH!!! It's been a very rainy fall here, so farming has been difficult! There is a little in the forecast for today,but we're hoping it doesn't happen! You don't often hear us say we don't want rain! Hope everyone has had a great weekend! I'm getting a few chores and such done, so maybe I can stamp something tonight. hey! i like your style! cars and cards! 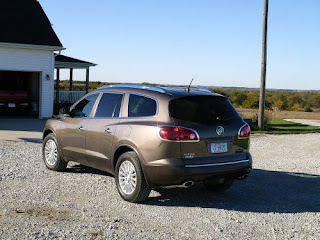 i have an enclave ordered - waiting - should be here next week!!! can hardly wait. Love your card style also!